Okay, not EVERY coffee shop show is awesome. It was all uphill after "Smelly Cat," though, wasn't it? Playing acoustically in a coffeehouse is a long-running tradition so entrenched in music culture it borders on cliche. But when you think about it, there aren’t actually that many occasions where such shows happen locally; for example, we can recall the Queen City Spotlight shows each Saturday at Borders Books’ coffee shop and occasional shows at Coffee Ethic downtown. Thanks to one local musician’s efforts, there is now another place to add to that small but proud list: Kaldi’s. We’ll explain after the break. 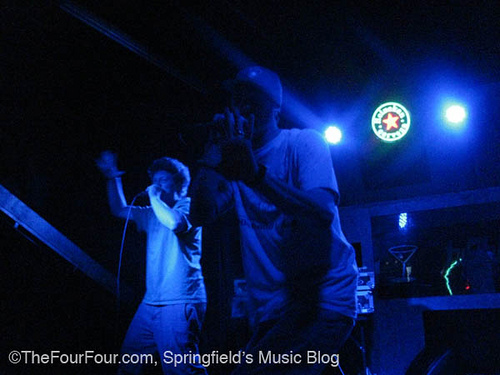 There are those pairings among bands that are rare and yet perfect, where two acts from different sides of the Springfield Music Scene team up for a unique and thoroughly entertaining show. One of the more unusual examples was the marriage of local hip hop group AcuMen with the two- man acoustic-metal comedy band Whoreberry Cobbler, a combo show not seen in two years… until now. The two acts finally reunite on a stage–and by “stage” we mean “floorspace”–in familiar confines, the building where most of the previous shows took place: The Tipsy Turtle Pub, known then as the original Bugsy Malone’s. Not only is this the first show the two groups have played together in two years, but it’s one of the very few times–perhaps the only time–Cobbler has performed since FourFourFest in November. A truly entertaining show will ensue tomorrow night, and it should get started between 9 and 10 p.m.
We’ve gone over the Forever Endeavor Productions show schedule before, but one reader pointed out a particular show we hadn’t really given its due: The Academy Is… playing April 9 at The Outland Ballroom. TAI is a pretty well-known rock group, so in a lineup of well-known rock groups this show may not seem unusual. 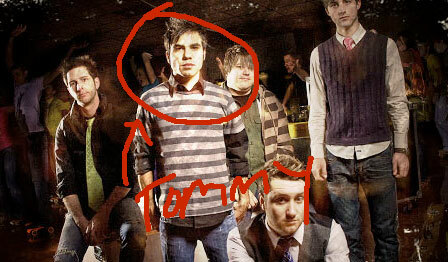 But peep the details: The band is playing acoustic. 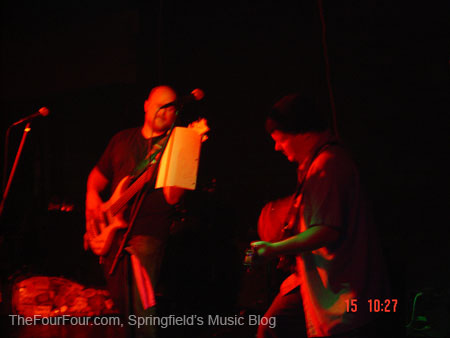 We haven’t seen a nationally touring rock act perform solo in Springfield since Trapt played at the Gillioz Theatre ahead of its Ballroom show, and that was many, many months ago. 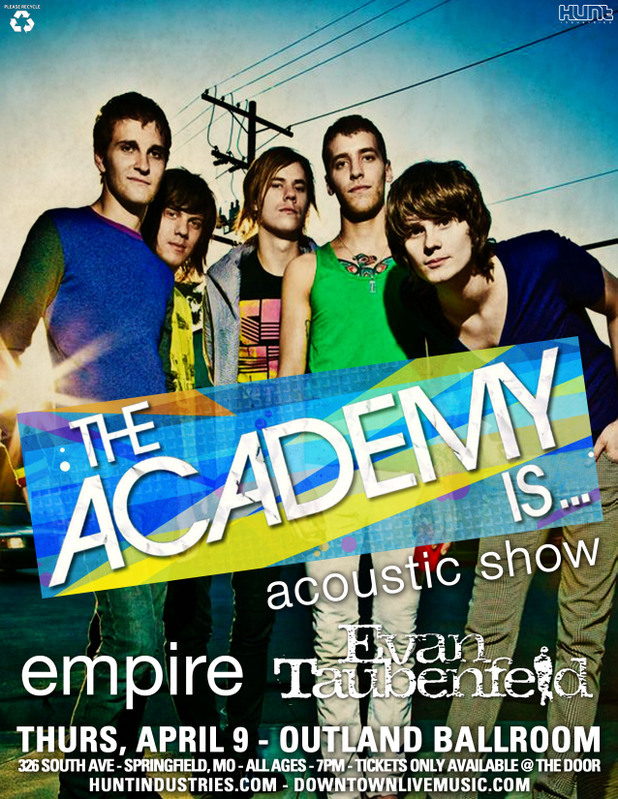 Also on the lineup are former Avril Lavigne guitarist Evan Taubenfeld and Empire. The all-ages show starts at 7 p.m. So... anyone wanna cover THIS song at the show? Boo war. Boo. That’s the way-censored version of the message several local acoustic artists are out to transmit with a night-long concert at The Magic Bean Coffeehouse Friday, March 20. So how does one protest something… quietly? We can point to 10 different ways, actually. See them all after the break. We just caught word of this late last night from Dan Magnum of Forever Endeavor Productions. Tommy, drummer of A Day Away and Springfield’s famous drumming group The Cadence, was hit by a car…yes I said hit by a car. He’s hurt really bad and needs support from the music community to help him get by. Fellow musicians to the rescue. A bunch of big names in the Springfield music scene are working together to put on a benefit show to help raise money so Tommy can pay some bills while he’s laid up.